While in Hirado (Nagasaki), my darling took a video of my hula as usual. The video was taken at 平戸港交流広場 (Hirado Port Exchange Plaza). 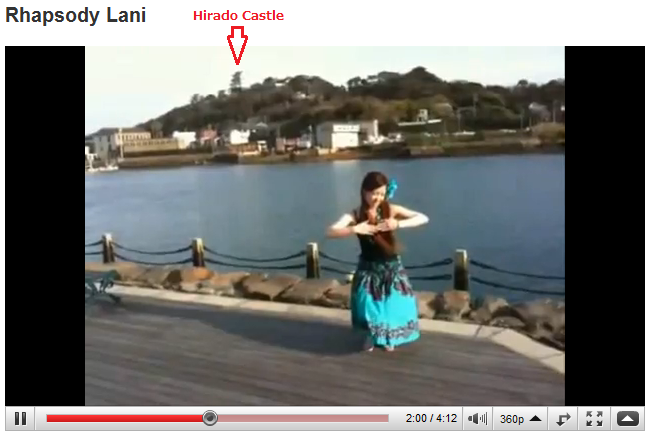 You can see 平戸城 (Hirado Castle) in the background! This time, I danced it at a few different places; however, this one was the best of all. One I took at 千里ヶ浜 (Senrigahama Beach) was not that good because the beach was slightly slant and my steps are bit staggering. Anyway, the view of the seashore well fits the hula dancing, so I will upload this video as well. Like before, I posted my videos on my YouTube account. For those who are not my friends at YouTube, I will only show this video to my blog buddies who keep in touch with me on a regular basis or Tipness club members who took this "hula hula" class. Please send me a request from my YouTube account. I will add you as my friend to view my videos. It is raining & cold again in Tokyo.